An ancient city full of peril and mystery awaits in the ruins of Sudanya, a lost civilization on the edges of Terrinoth. Horrid creatures haunt the heroes' every step, but powerful allies will guide them through the twisting maze of wilderness and broken cityscape. 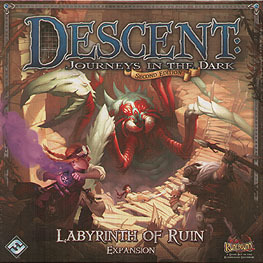 Experience a thrilling new campaign for Descent: Journeys in the Dark Second Edition. Filled with new quests, monsters, classes, and relics, Labyrinth of Ruin provides hours of exciting adventure. Set in a previously unexplored region of Terrinoth the "Labyrinth of Ruin" campaign takes players on a riveting journey to the ruins of a forgotten city. Throughout the many quests included in this expansion, heroes will have the opportunity to enlist the aid of unique allies in their quest to stop the evil overlord. With 17 plastic figures, 18 map tiles, over 100 cards, and much more, Labyrinth of Ruin is the perfect addition to your Descent: Journeys in the Dark Second Edition collection.